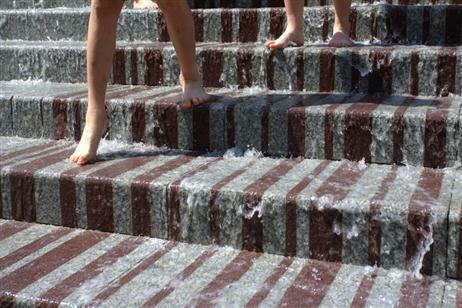 Darlington’s town centre water feature, Market Cascade, located on West Row, was joint winner of the Fountain Society’s 2009 ‘Best New Fountain or Water Feature’ in the UK in the last 5 years. Designed by artist Michael Pinksy as part of the regeneration of Darlington Town Centre, the fountain provides a new heartbeat to the town centre. Market Cascade was commissioned as part of the Pedestrian Heart scheme, which saw the pedestrianization of Darlington Town Centre, with artist Michael Pinsky working on the design team. It stands on the historic market location and signifies the washing down of the streets at the end of the market day. It uniquely features a red granite barcode, which links the history of the market town and refers it to present-day commerce, whilst signifying the blood from the meat market.